The RM Partners Medicines Optimisation group is working both locally and across London to address and implement the recommendations from the NHS England National Cancer Strategy, Achieving World-Class Cancer Outcomes, which was published in 2015 by the Independent Cancer Taskforce. The taskforce looked at how cancer services are currently provided and set out a vision for what cancer patients should expect from the health service. The report included 96 recommendations to help transform the care that the NHS delivers for all those affected by cancer, including improving access to chemotherapy and systemic medicines for cancer, whilst improving the patient experience and reducing unwarranted variation through use of best practice. The work of this group follows on from the previous successful projects of the Cancer Vanguard – Joint Medicines Optimisation Group. One of the key projects, led by RM Partners working with Sandoz, involved developing an education and engagement programme about the use of biosimilar medicines. This programme aimed to improve healthcare professionals’ understanding of biosimilars and help them to better inform patients about their use and assist in their timely introduction when appropriate. 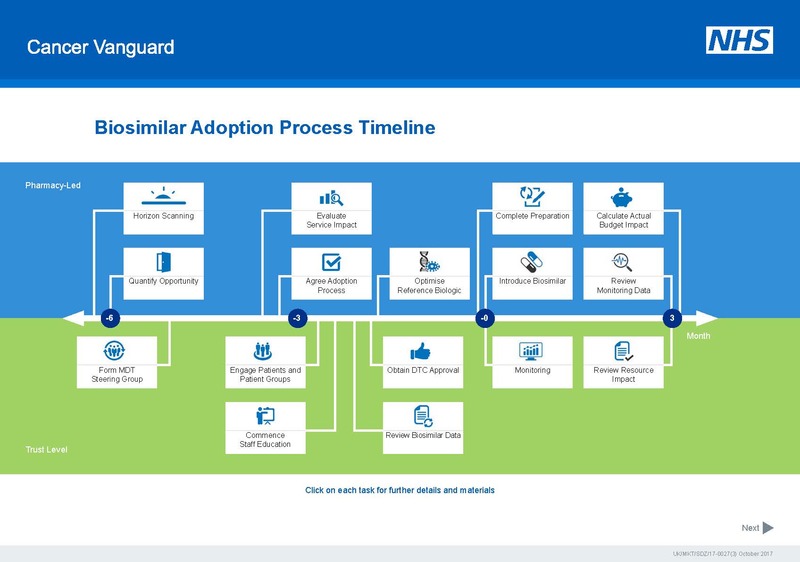 A process timeline for adoption was developed with accompanying guidance, resources and template documents to support the NHS to enhance biosimilar uptake. More recently, RM Partners worked in collaboration with the charities Breast Cancer Care and Breast Cancer Now to develop a national patient information leaflet ‘Trastuzumab Biosimilars’. The London Cancer Alliance (LCA) produced standardised systemic anti-cancer therapy (SACT) protocols to be used across the LCA. Furthermore, the LCA also developed a number of educational and training materials for SACT healthcare professionals to raise standards across the network. These materials have been adopted by RM Partners and are still available for use. The documents are due to be reviewed to ensure they are up-to-date and in line with the latest developments in medicines and national guidance. The RM Partners Medicines Optimisation Group hosts a number of educational events throughout the year. The aim is to provide clinical and practice updates for all levels of pharmacists and technicians with an interest in oncology or haematology, as well as provide an opportunity to share ideas and best practice. For more information, please contact Jatinder Harchowal or Anita McWhirter. An interactive PDF is available to download that will provide you with the information you will need to help with adoption of biosimilars in your Trust. Within the PDF is a suggested process timeline, setting out the processes that pharmacy might follow, as well as more general Trust guidance on this.